Real Madrid and AS Roma clashed at the Cotton Bowl stadium in Dallas this Tuesday evening and just as we had seen happening a few days ago, the Merengues struggled again to get past an well organized Italian side. A goal from Francesco Totti in the second half proved to be enough to defeat Carlo Ancelotti's men, in a game where there was still no signs of Cristiano Ronaldo on the pitch. 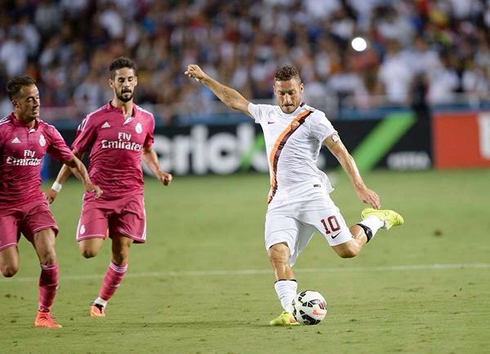 This US tour is probably not going the way Carlo Ancelotti had initially wished, as Real Madrid came out of their 2nd pre-season friendly with another loss, this time in regular time and after getting defeated by 1-0 against AS Roma. 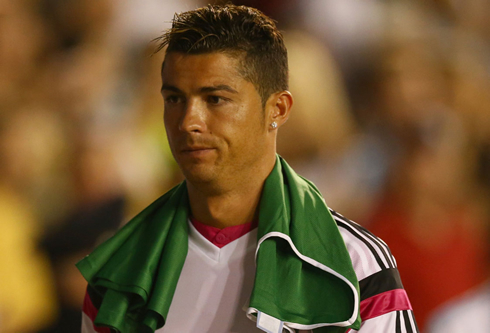 Just like we had previewed a few days ago, Cristiano Ronaldo didn't get to earn any playing minute in Dallas last night, but all indicates that he should finally have an opportunity to warm up his engines when Real Madrid steps up at the Michigan Stadium in Ann Arbor next Saturday evening, in order to take on Louis Van Gaal's Manchester United. As for tonight's game, the Italian side edged the reigning European champions thanks to a Francesco Totti goal scored inside the first quarter of an hour of the second half. Unlike the first game against Inter Milan, this time Carlo Ancelotti already had at his disposal several more options ahead of tonight's match with AS Roma. The Italian manager lined up a clearly stronger starting eleven than the one we had seen last weekend, with Iker Casillas in the goal, Carvajal on the right, Fábio Coentrão on the left and Pepe pairing up with Sergio Ramos in the center of defense. The midfield tasks were left over to Asier Illarramendi and the returned Xabi Alonso and Luka Modric. 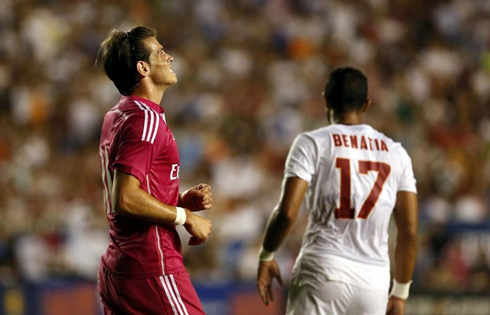 Ahead of them, Gareth Bale and Lucas Vásquez took over the wings, while Isco was put on a "false 9" forward role. One of the reasons for undertaking this last tactical approach has to with the fact that Real Madrid ended up coming into this United States pre-season without any first team centre forward available, since Alvaro Morata ended up signing for Juventus a couple weeks ago and Karim Benzema is only going to kickoff his his pre-season training over the next days. Ancelotti did 4 changes during the break, sending in Diego López, Arbeloa, Nacho and Raúl de Tomás. However, the Merengues didn't respond as well as they had done in the first half and it was actually Roma who started creating the best chances as the second half progressed. The Italians found a way to score the only goal in this game following a great attacking play around the 58th minute of the second half. 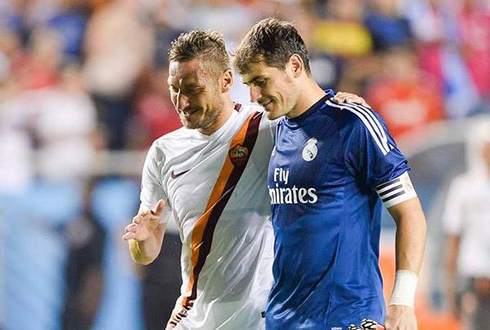 It all started with Seydou Keita finding Florenzi on the right with a low pass, but not before Totti cleverly opening his legs for the ball to go through and by doing that, tricking several Real Madrid defenders with his dummy move. Florenzi then managed to return the gesture to AS Roma's captain and assisted Francesco Totti in the middle for the 37-year old midfielder to finish it off and send it past Diego López. Real Madrid never got to look very threatening in any moment of the second-half and not even after the goal things would get much better. With tonight's loss, the Merengues are already unable to reach the ICC (International Champions Cup) final, but they'll still have one last game this Saturday (August 2) against Manchester United, a friendly which is set to be played at the Michigan stadium, in Ann Arbor. If all goes according to planned, Cristiano Ronaldo should finally get his first playing minutes this season, either as a starter, or as a substitute coming on later in the game. Attackers: Lucas Vásquez, Gareth Bale, Isco. Cristiano Ronaldo has already joined his teammates in the United States in the past weekend and he might have his first opportunity to play this season against Manchester United, on August 2. You can watch Juventus live stream, Real Madrid vs Manchester United, Nice vs Barcelona, Manchester City vs Liverpool, and Vitesse vs Chelsea, all matches provided from our live stream game pages.